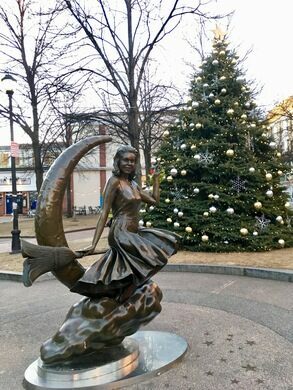 At the end of the Essex Street Pedestrian Mall in Salem, MA, is six-foot-tall bronze statue of Elizabeth Montgomery. 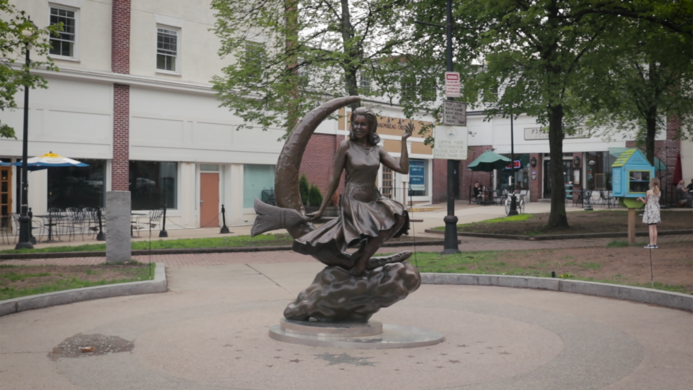 The statue was sponsored by cable channel TV Land and commemorates the 60s-era sit-com Bewitched, in which Montgomery played a witch named Samantha who tries to live a normal married life with her non-warlock husband. 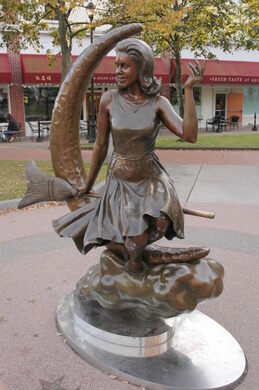 Unveiled in 2005, the six-foot-tall statue depicts Montgomery astride a broom and flying in front of a crescent moon. The statue is more relevant than just the fact that it matches the theme of the town. In 1970, Bewitched filmed a series of episodes on location there after a fire shut down its Hollywood set. The episodes have come to be known as the Salem Saga and featured many of the landmarks of the city. The arrangement ended up being a great tourist boon for the city, helping to elevate awareness of the historical location.